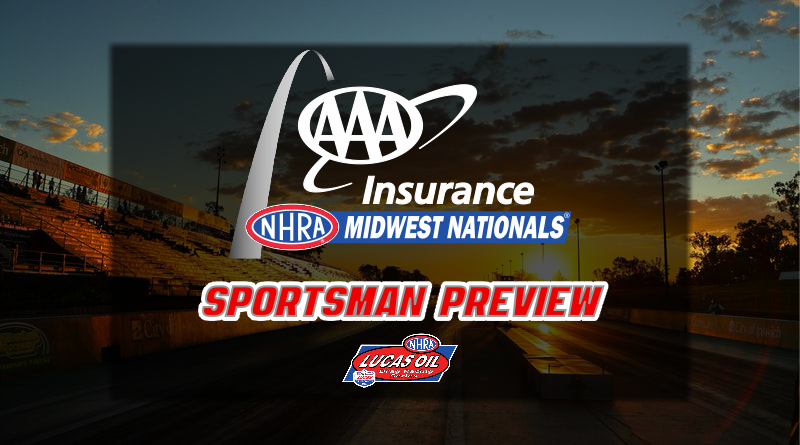 ST. LOUIS – The NHRA traveling road show rolls into town on Friday for a three-day race weekend. Over 300 of the best sportsman racers in the country will descend on Gateway Motorsports Park looking to add the coveted Wally to their trophy case. In addition to trophies and money, a number of racers will be looking to add to their season-long points total in hopes of winning the national championship at the end of the year. With the season winding down, racers are running out of time, and races, to collect points towards the championship which should make for an entertaining weekend of racing. The sportsman pits will be overflowing this weekend with a full range of classes in attendance. Along with the traditional Super Stock, Stock Eliminator, Super Comp, and Super Gas classes St. Louis will also feature the ever-popular SAM Tech NHRA Factory Stock Showdown, Top Dragster, and Top Sportsman classes. The three-day event schedule will include qualifying and time trials on Friday with tons of racing on Saturday as the sportsman classes have four rounds of eliminations for the day. Racer’s lucky enough to make it to Sunday will complete the semifinals and finals on Sunday afternoon. Last week DragChamp set the bar high in the Dodge NHRA Nationals event preview as we accurately predicated one finalist in each of the four sportsman classes and also had three of the four racers win the event. We’ll see if we can keep the streak alive this week in St. Louis. Here are our picks to win each class. The 53-car Super Stock field is loaded with talented drivers such as David Rampy and Brad Zaskowski. Zaskowski, currently No. 3 in the world, is claiming his last national this weekend. He needs to make the final round to take over the points lead from Justin Lamb. Slate Cummings – This guy loves to drive the finish line and he’s super talented at it. A repeat of last year is a huge possibility. Brad Plourd – Bad Brad has been somewhat quiet on the NHRA national side this year so I know he’s due for a big win. Greg Stanfield – You can never go wrong picking a 4-time World Champion. Stanfield Power to the front. Both Slate Cummings and Jeff Lopez will be looking to collect valuable points towards the national championship as they are both currently ranked in t he Top 10 nationally. Jeff is picking up all of his points this week as he has only been to two nationals so far this year. Slate will be improving a first round loss. Jeff Lopez – After a super-hot start to the year, Jeff took the summer off. Look for him to finish the season strong starting this weekend. Adam Davis – Davis is a win looking for a place to happen as he has made tons of rounds this year but has yet to seal the deal. It would be cool to see someone other than Jody Lang park a wagon in the winner’s circle. Austin Williams – It’s been a quiet year in Stock Eliminator for Austin, a win this week would turn his year around. The FSS class should be interesting this week as we’ll see if the field was able to close the gap on the DSR cars after they ran-away-and-hid from the field at INDY. We’ll also get to see if Joe Welch is able to pass tech at St. Louis after failing twice at INDY. If Welch gets through tech clean, he could be a handful as he has a super-fast Dodge. Leah Prichett – After a dominating performance at INDY, I’d be a fool to pick anyone other than Leah. She’s got a fast car and she drives it like she stole it. A deadly combination for sure. The Super Classes are always a tough pick as the entire field is super-competitive. Points will be top of mind for Austin Williams and Koy Collier as both need to make the final to take over the national points lead. Don Nichols will also be chasing points this week as he’s only claimed two nationals this year so he add full points to his total. If he has another deep run this week, he could put himself in the driver’s seat for the national championship. Red-hot Devin Isenhower, man I’ve typed his name a bunch in the last month, is out of races to claim for the championship but he will be looking to add another Wally to his collection. Tommy Phillips – I’m going with the defending event champion to repeat. Tommy is the class of the field even though he’s racing less this year. Michael Miller – The Division 5 runner from New Mexico is always a tough out. Jacob Elrod – Coming off of promoting a great event last week at Dragway 42, Elrod should relax and have some fun this week. Repeat what I said above about everyone in the field is tough and they all have good equipment. The Sawyer family, Ray and Mike, will be chasing points this week as Ray needs to make the final round to overtake Devin Isenhower in the national points chase. The Sawyer’s tow will be just over 1,100 miles from Massachusetts’ to St. Louis. Other racers looking to add to their points totals are Koy and Jackson Collier as they both sit inside the top 10 nationally. Ray Sawyer – I’m sticking with the hot-hand. Sawyer has a fast car that lays down sick laps every round. Back-to-back? Tommy Phillips – Yes, this guy is so good I’m picking him twice. Jackson Collier – A key member of the talented Collier Family Racing team. Jackson continues to make rounds and take down some of the biggest names in the sport. He’s overdue for a big win. Based on the event list, the biggest challenge for the Top Dragster competitors this week may be just making the show. With a large number of fast cars, look for the bump to be in the 6.30-second range. Mark Jones and Ross Laris, both ranked in the Top 5 nationally, will be looking to add to their totals as they chase Paul Nero for the championship. Mark Jones – Coming off a big win in South Georgia, Jones is looking to chase down Nero for the TD title. Jeff Strickland – Strick is super-talented and due for a big win. Aaron Stanfield – This young man is always in the mix. I think he learned a little something from his Dad. Although there will be little, if any, points implications at St. Louis this week, there are a host of talented Top Sportsman racers on hand. Mark McDonald – Talented driver with a cool ’67 Mustang. Mike Williams – A win would make the long tow from Canada worthwhile. Former World Champ knows how to get it done. Jim White – Division 5 runner lays down great laps, should be in the mix this week. Check back daily with DragChamp.com for more sportman class updates from the AAA Insurance NHRA Midwest Nationals. Drag Champ is the online source for NHRA sportsman drag racing news, updates, and results.